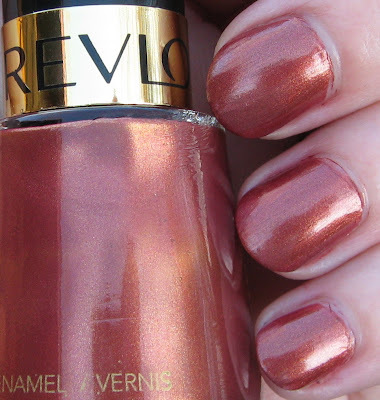 Revlon Amber Ablaze, You Disappointed Me! 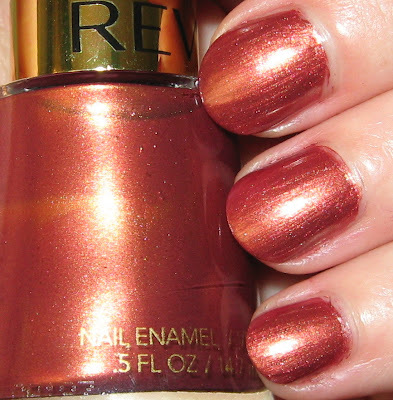 Above & Below: Revlon's Amber Ablaze looks to have great potential in the bottle, but not so much on the nail. Now wouldn't you think a polish that looked so promising in the bottle, would look nice on the nail? That was not the case unfortunately, with Revlon's Amber Ablaze. I saw this at Walmart a few months ago, and naturally, the gold intertwined with the coppery color caught my eye. I can never pass up a gold-laced color, and am always mesmerized by their veil of golden shimmer over whatever the base color may be. Perhaps there's not enough contrast between the gold and the base color of this one, because it just looks like a copper shimmer, once applied. And it's not even that pretty of a shade of copper. This shade actually photographed better than it looks in real life. So what we have here is a polish that looks stunning in the bottle, but not so much on the nail, and also a polish that photographs well, but is actually quite plain and nothing outstanding color or finish-wise in real life. Amber Ablaze, you are a trickster! Try "Blackberry" if you can find it. The name is deceiving...it's not purple at all...and might be the color you are really looking for. It is a pretty color but I would have been disappointed too. So sorry! 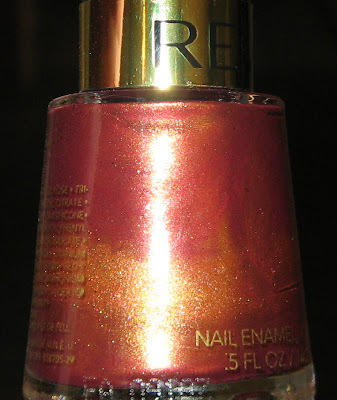 How strange - It does look like it would have alot of gold shimmer and contrast from the bottle photo. I actually like this one, although I would have been disappointed too judging from the bottle. I hate when a polish bottle lies! I thought this looked lovely on you. But it looks better to me than you! That's a strange one. I think I might've had this years ago. It just seems so familiar. Shame on that polish. I have "Bronze Ablaze" and it was pretty neat when it finally dried. This color is very pretty! Bronze Ablaze was very metallic. My nails are not as nice as yours, though!!!! I'm behind on answering comments (again!). Thanks for the replies...I do have Revlon Blackberry and love it! I guess I don't dislike Amber Ablaze, because I love coppers. I just thought it would have a little more going on based on those gold swirls you see in the bottle! Is this from the same limited edition series as Rosefire? You may like that better since the gold shows more. I tried it on my bare nails in the store! Sorry! It's fantastic. It is finally the color I've been searching for -- not brown, not pink, not too sheer, PERFECT! Just my opinion! @anon...me too! I LOVE this polish...earthy, but not too just browwwwn. I can't find it anymore, tho :( Where did you get it? Anyone?